Is there a better alternative to HowManyPieces? Is HowManyPieces really the best app in Designs and Graphics category? Will HowManyPieces work good on macOS 10.13.4? HowManyPieces is primarily aimed at quilters who like to design, but would prefer doing as little math as possible. Have you ever cut up a piece of fabric, thinking that you would certainly get from it the number of pieces you expected, only to find that, having cut the fabric, you didn't quite get enough of those pieces from it? HowManyPieces helps to prevent that, by giving you a precise cut figure size (no more having to calculate that yourself! ), a layout for that cut figure, and the number of figures you can expect to cut from that piece of fabric. HowManyPieces needs a review. Be the first to review this app and get the discussion started! HowManyPieces needs a rating. Be the first to rate this app and get the discussion started! The math is done for you! Save the report as a PDF, or print it and and get cutting! Note: The generated layouts leave VERY little room for cutting error. If you think you need to allow for a less-precise cutting style, you may not get quite as many figures as shown in the layout. 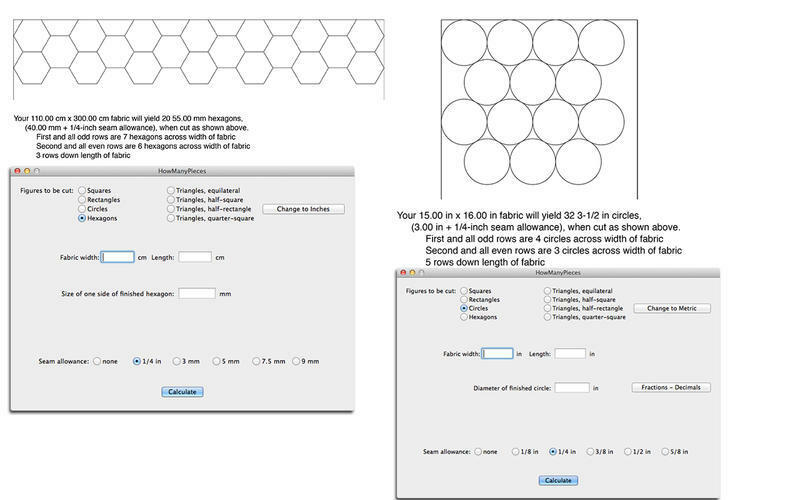 Practice a bit to see how your cutting style compares to the generated layout.